Fact: until this week I had been to Scandinavia more often than Wandsworth. And I had been to Scandinavia twice. I’m a north London boy, born and bred. I know east London a bit and west London a bit, but anything further south than the South Bank and I’m lost. I’ve got nothing against it, but this is a big city and one man can’t know all of it. I was tempted into a second trip to Wandsworth (the previous being a visit to the excellent Thameside drinking establishment The Ship, which suggests a certain theme to my capital exploration) by the prospect of German wine and Scandinavian food, the grub prepared by Signe Johansen of Scandilicious fame. Those Scandinavians, you see, simply love their German wine – it makes up more than a third of all white wine consumed in Norway, making them the world’s fourth-biggest importer of all deutsche wein, behind only the US, the UK and Holland (Sweden is at No7, with Finland at 14 and Denmark at 16). Interesting German wine-sales stat, while we’re here: the average bottle of German wine sold in Norway costs precisely 2.14 times as much as its equivalent here in Blighty, where the inglorious likes of Tesco Liebfraumilch Pfalz or Sainsbury’s House Hock (both £3.99 a bottle) presumably make up a fair old chunk of sales. Other interesting German wine-sales stat: though Germany is still Britain’s eighth most-popular wine producer, we import 52% less of their juice than we did a decade ago; meanwhile the fastest risers in our top 10 include Chile (up 83%), Spain (up 78%) and New Zealand (up a vertiginous 283%). 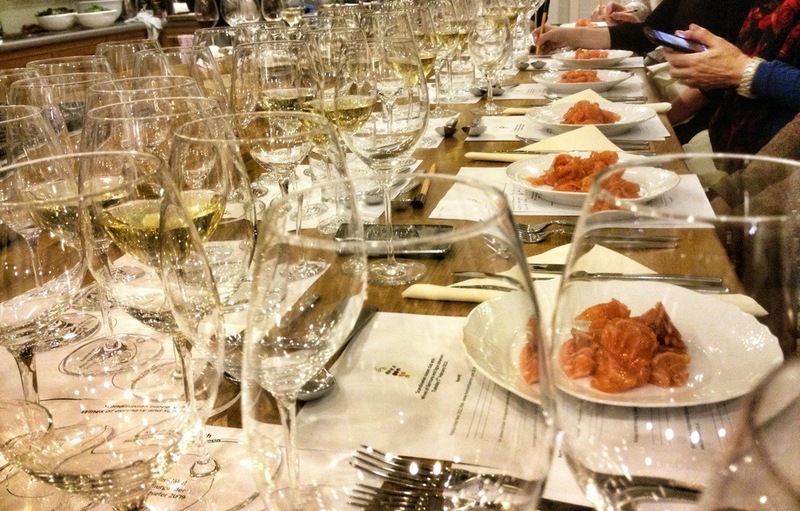 It’s not hard to see why they’re such a bunch of riesling-guzzlers up there. 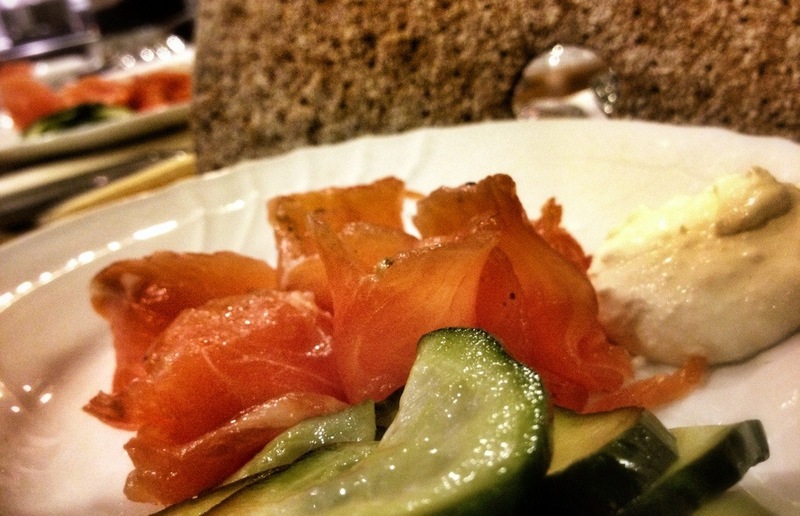 Scandinavian food + German wine = an inevitable combination of riesling, cured salmon, pickled cucumber and crispbread coming up sharpish, and it’s no less delicious for its predictability. The salmon we got, cured with fragrant, subtle and obtainable-by-mail-order-or-by-actually-finding-wild-dill-flowers-and-shaking-them-only wild dill pollen, was so good I’m going to make my own next week (the Financial Times has the recipe), with a riesling labelled trocken but revealing a gentle just-sweetness working very nicely alongside. The main course – a venison stew, served with salt-baked celeriac, buttered sprout-tops and a pearled spelt and mushroom combo – was less successful; the meat hadn’t cooked to melting tenderness, and was too darkly savoury to make best use of the fruity pinot noirs offered alongside (a pre-dinner nibble of nutmeg-laced veal and pork meatballs did a better job of that). Three pinots were poured, most notably the widely-praised Palataia (£8.99, M&S, but showing out of stock online), which seemed to me a little over-alcoholic at 13.5% and is some way from being the best wine you can get for nine quid; and a comparatively subdued – which is not a criticism – Peter & Peter 2011 (£10, Tesco online) which is currently on offer at £7 and is decent value at that price. Pudding was most excellent, first a heavily almonded rhubarb cake, and then a delicate yet decadent madeleine – more of that nutmeg in use here – both of them subtly rather than aggressively sweet, allowing the lemony liquid lusciousness of the rieslings they came with to do their thing. I’m not one to get hung up on wine-and-food matching, but some things are just right. For me this is where the kabinetts and spätlese of the riesling world are at their very finest, holding hands with just-sweet, starchy food – be it madeleines for pud or butternut squash soup for starter. 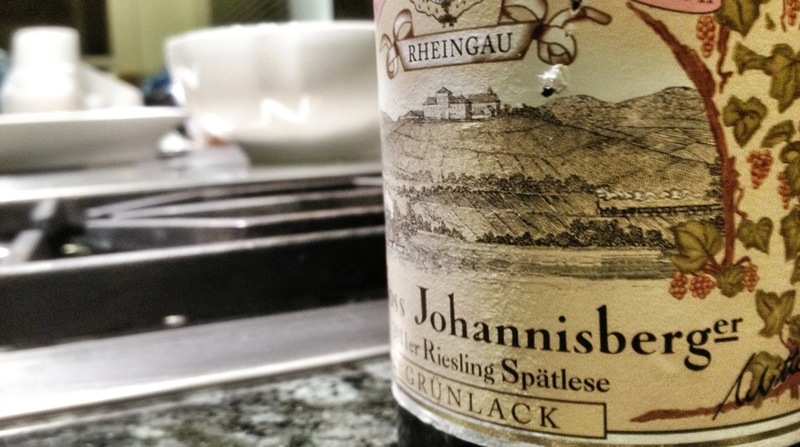 This – a 2011 Schloss Johannisberger spätlese from Grünlack – was the last wine of the night, and also my favourite, bright and fresh and anything but cloying. Inevitably, it was also the most expensive – it generally costs around £40, though the price at Strictly Wine (I’ve never used them and can’t vouch for them) is significantly cheaper, at £28.99. It’s not the biggest bargain in the wine world, but I’d wager that it’s better than seven-and-a-quarter bottles of Sainsbury’s House Hock. Hi there! I could have sworn I’ve been to this website before but after looking at many of the posts I realized it’s new to me. Anyhow, I’m certainly pleased I came across it and I’ll be bookmarking it and checking back regularly!